We went deep into the heart of Arizona to see the earth and the sky display their magnificence. After the last of the retreats of our summer tour, Adam and I drove for four days back to Milwaukee. Our first stop was one of the seven Natural Wonders of the World, the Grand Canyon – an impressive and inspiring landscape, overwhelming our senses with its immense size and beauty. As our visit guide explained, almost two billion years of our planet’s geological history have been exposed as the Colorado River and the wind cut through layer after layer of rock. This erosion resulted in combinations of spectacular forms and delightful geologic colours like every shade of red, citron, buff, russet, and pink. In its depths, the canyon is deep red, and at times brown or violet. It is incredible to behold how the Colorado River carved its magic on the Colorado Plateau. While the view from the top of the rim is breathtaking, the real experience comes from hiking down into the canyon and feeling its power and beauty all around you. It was then that the real contemplation of the Grand Canyon started for me. It was not enough to simply make our way through Japanese and German tourists to take the mandatory selfie near the cliffs. I needed to have a deeper experience of the Canyon. Climbing down into the Canyon prepared my mind, body, and soul for an encounter with God, in the same way silence prepares me to encounter God through Sacred Scripture. The beauty around us, Adam’s company and friendship, and the wildlife we encountered all reminded me of God’s passionate love for me. After climbing back up and having dinner, evening had fallen and we made our way back to the main view area to await for complete darkness to envelop the wide Arizonan sky. What followed was another impressive sight: thousands of twinkling stars. In the dark and moonless sky, we saw stars, planets, stardust, satellites, and even the Milky Way. It was awe-inspiring and very relaxing. The isolation from big cities and their increased light pollution makes the Grand Canyon a wonderful spot for star-gazing. The lack of luminous backwash from buildings, neon lights, and street lamps provides the perfect backdrop to contemplate the universe. The contemplation of the stars inspired three distinct moments of gratitude in me. First, I was thankful for the night; for without the darkness, I could never see the stars. Then, I had a Carl Sagan moment of understanding my relation to the universe that I was contemplating. In his own words, “The nitrogen in our DNA, the calcium in our teeth, the iron in our blood, the carbon in our apple pies were made in the interiors of collapsing stars. We are made of starstuff.” As I contemplated the heavens, I experienced my own creature-hood: “I am created. I am part of this creation. God created me out of love.” That led to the third moment of gratitude. Beholding the sky a song rose in my heart: Glory to God in the highest, and on earth peace to people of good will. My heart prayed this for a while. Glory to God in the highest. 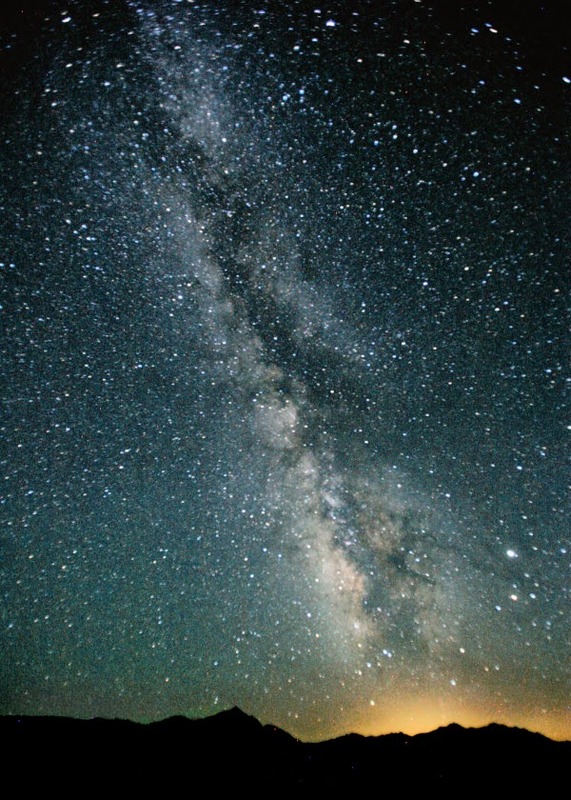 Glory and praise to God for the highest – for the stars, for planets, stardust, and our own Milky Way. While we laid on some rocks by the cliffs, we were reminded of St. Ignatius who, towards the end of his life, would find God in blades of grass and at night in the contemplation of the stars. This reminded me of the type of spiritual freedom necessary to behold God in his creation. I have learned that I must be willing to detach myself from the pull of the ego to experience the presence of God in nature. Climbing up and down the canyon, or beholding the Milky Way is not about what it is in it for me, like a picture or a story. Rather, it is about what the Lord wants to reveal to me through his magnificent creation, and that includes all of me. Every time I physically leave the world of buildings, highways, and technology to get out into natural surroundings – meadows, mountains, forests, lakes, seas, deserts – the first reactions are usually joy and relief: “Wow, look at that”, or “It’s so beautiful, so peaceful”. Then, after uploading a couple of pictures to Instagram, I am pulled back to the world of schedules, meetings, and responsibilities. It usually takes a second effort to relax and to put aside thoughts of the everyday world in order to notice that a whole complex universe of plants, insects, animals, and birds is in a state of busy activity all around me. At the end of the Spiritual Exercises, Ignatius asks us to contemplate how God creates everything – including us – out of love, and how he dwells and labours in all things. Gratitude is the natural response to this contemplation of God’s love for us, and it inspires us to love God in return. In the words of Dante Alighieri in the Divine Comedy, we are moved “by the Love that moves the sun and the other stars.” We are moved by Love to love. God is actively creating in, through, with, and around us. If God can be found in all things, we have a vocation to find him in all things. Our vocation is to behold how God’s love overflows in all things, to marvel at his creation, and to ponder how God dwells and labours in the world around us. God is the source of all goodness. Like the Colorado River on the Colorado Plateau, his love wants to cut through layer after layer in our hearts of stone, to transform them into hearts of flesh moved to gratitude, love, and a desire to serve the world. Some journeys end so that others may begin. The Colorado River’s journey ends in the Gulf of California. Our road trip came to an end in the Midwest. Every journey is an opportunity to increase in faith, hope, and love. My visit to the Grand Canyon was a religious experience. Though the gorge was mute, God spoke to me at the Grand Canyon. God touched my heart and prepared me to behold the world in a different way for the rest of the trip: behold and pray. This road trip filled me with holy desires and animated me to continue the mission Christ entrusted to all Christians: Go into the whole world, and preach the gospel to every creature (Mk 16:15). The trip reminded me that, at times, we are also invited to let every creature preach the gospel to us. The Spirit of Jesus summons us for the adventure ahead, to explore the world, to find God in all things, to let our hearts be transformed, and to let his love flow like a river reaching every nook and cranny on its path.